Comedienne and fashion commentator Joan Rivers established a costume jewelry company in the early days of QVC (television shopping channel) and soon became one of their best draws, not only because of the fun of watching Joan sell her products but also because of the quality of the items. Later on Joan branched out into apparel and other items, but it is her jewelry, and her gift of laughter, for which she will be remembered. Unfortunately Joan died in 2014 but her company, as of this writing, still exists under the leadership of her daughter Melissa. 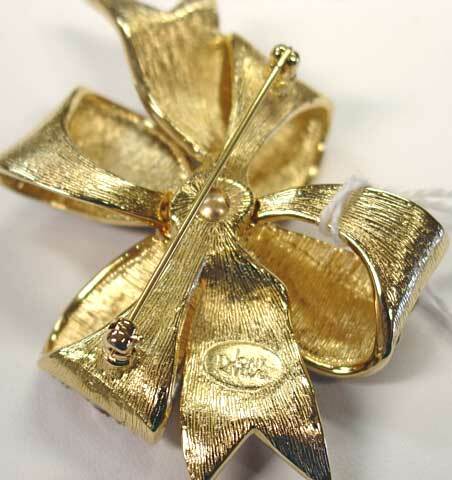 Description: Joan Rivers Classics Collection Violets Brooch - At least, I think these are supposed to be violets! 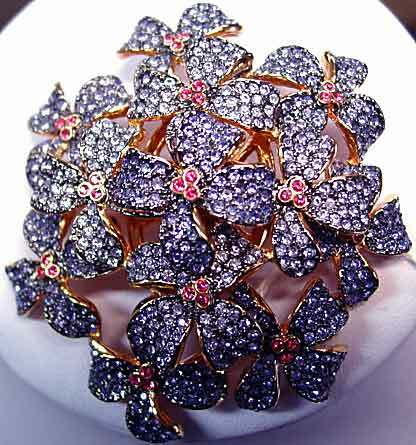 Layered florals are done in tanzanite (blue-purple) and light sapphire rhinestones, all set in a black enameled surface for the pave work, the rest of the piece is goldtone. The centers are rose pink rhinestones in sets of three. Very 3 dimensional, which made it difficult to measure accurately, but about 3" x 2 1/2" x 3/4" deep. Excellent condition, comes with original box, romance card and black velvet drawstring pouch. 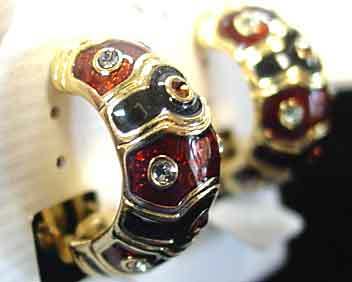 Description: Joan Rivers Demi Hoop Earrings in Black and Brown Enamel and Rhinestones - Black and red-brown enamel alternate along these hoops, separated by goldtone strips, and set with opposing rhinestones (black diamond in the red-brown enamel, Madiera topaz rhinestones in the black enamel). I guess we're going for a ying-yang effect here! These are really pretty, well made, and have the padded clip back that made these comfortable for clip wearers. Excellent if not mint condition. Domed, 1/2" wide, 1" tall, 5/8" deep. Always good quality. 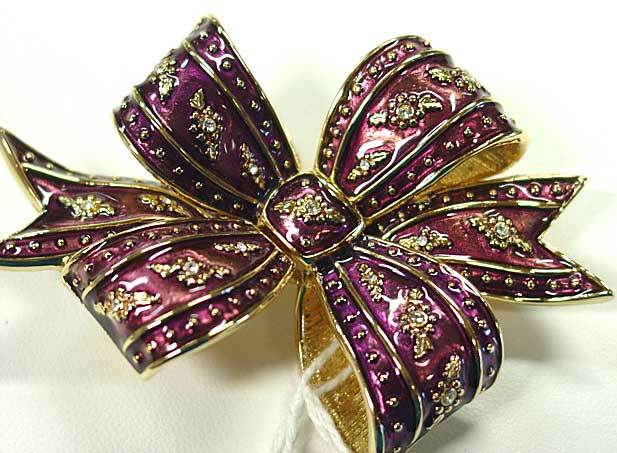 Description: Joan Rivers Purple Enamel 3-D Brooch -Early 1990's piece from the style icon and comedianne extraordinaire, in mint condition. I think this color would maybe be described as "plum" as the color has a little pink in it, rather than a royal purple. 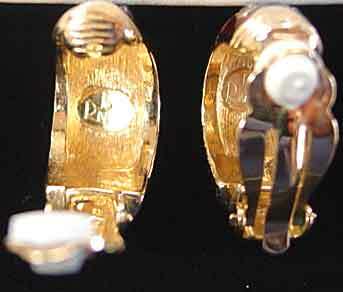 Goldtone, 2 1/4" x 1 3/4", loops are about 1/4" to 3/8" deep. Goldtone hobnailing on the edges of the loops and tail, and small decorations are centered with a clear rhinestone, a lovely, subtle touch that isn't obvious at first glance. Original black logo bag included. The early pieces are among Joan's best, very nice quality and weight. Description: Joan Rivers Set of Two Bracelets - "Night and Day" - Identical bracelets, one with clear rhinestones, one all metal. Goldtone, 7 1/4" long x 1/4" wide. Pristine condition, never worn. From the early days of Joan Rivers on QVC when all pieces were made in the USA. 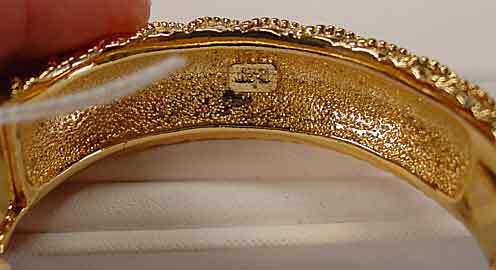 Description: Joan Rivers Clear Rhinestone Heavy Hinged Bangle Bracelet - This is from the 1990's when this company's pieces were the best quality. 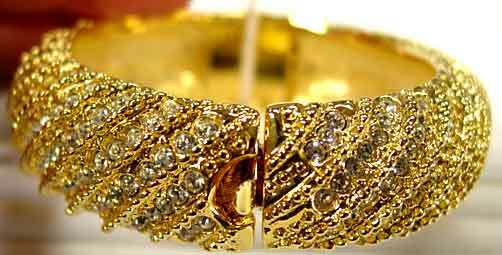 Rows of clear rhinestone alternate with goldtone cast "stripes" in this domed hinged bangle. 2 3/8" x 2", not quite 3/4" wide. Nice substantial weight, in pristine condition with all clears in sparkling condition (picture makes them look grey but they are not in person.) Whether you are a JR jewelry fan or simply like a piece of nice, expensive looking costume jewelry, this is very nice for going out to dinner or the theatre. Signature bag included. 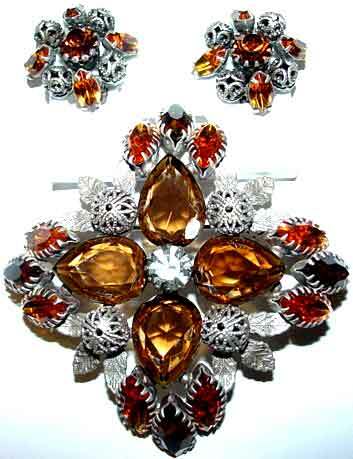 Description: Joan Rivers Maltese Cross Brooch and Earrings Set - Or, a square brooch set on the diagonal, if you prefer. Nonetheless nicely done and an unusual but very wearable color combination. 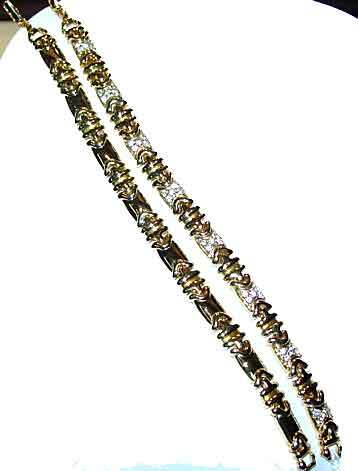 Very nice quality unfoiled glass pear shaped stones in smokey topaz are flanked by sets of three multi prong set golden topaz marquisesand separated by filigree balls on top of a set of three small leaves, all centered with a single black diamond rhinestone. Clip earrings alternate prong set topaz marquises with slightly smaller filigree balls, all around a light smoked topaz rhinestone that is multi prong set. 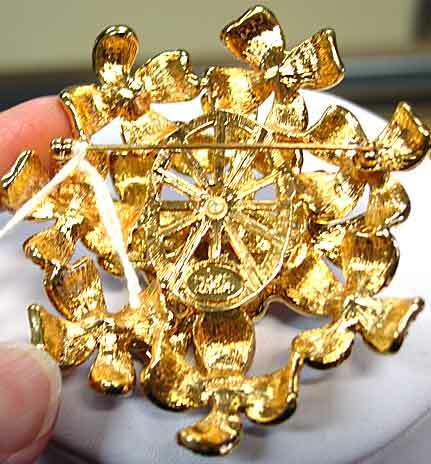 Brooch is 3" in diameter, earrings are 1". 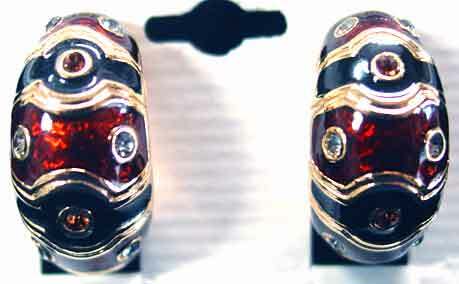 Setting is a pewtery colored metal. All is in perfect condition. Joan has sold her not-inexpensive jewelry on QVC for along time, I am guessing over 20 years, and I have no idea of the age of this set.